As I first read author Edward Abbey's book, "Desert Solitaire - A Season in the Wilderness”, I loved both his writing style and his subject matter. In that book, his style was simple, direct and observational; yet personal, all at once. His subject was the old Arches National Monument near Moab, Utah. With rye humor, he wrote about the animals, plants, hoodoos and summer tourists that populated the area around Devils Garden campground. It was there, as a mid 1950’s park ranger that Abbey lived for part of two seasons. His second season ended with a train trip home to the east coast that started at “Thompson” (Springs). Can one think of a more ignominious way to leave Canyonlands than at a railroad whistle-stop on a cold, rainy night? That night, one Jeep with 4-wheels spinning, drove north of Moab on Valley City Road. With the heavy rain, mud flying from the wheels and the engine floored-out, the wipers swept across the windshield just fast enough to smear the red mud away. They were late to the station and flagging down a cross-country passenger train at Thompson was rare and dangerous. With no time to take the paved road, they continued northeast, their wheels barely touching the muddy ground. The driver, squinting through the muddy glass, was sad to see his friend go. The other was heading east to a promised job and money. That need drove the man back home. 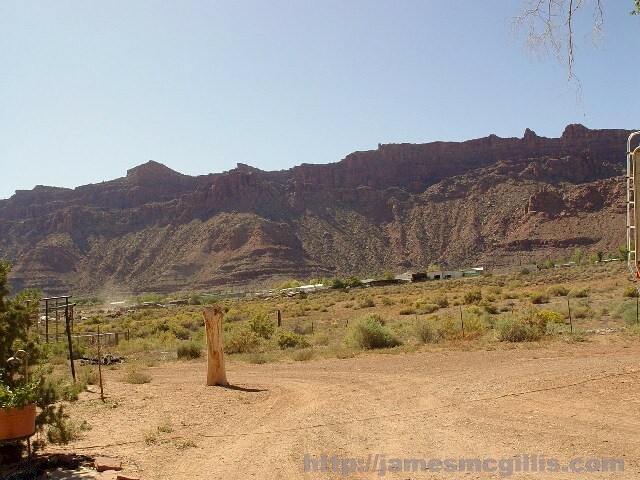 At Arches, he had experienced the secrets of God’s creation. Later, he was to live in Oracle, Arizona. Between his birth and death, he like to say that his life took him from Home to Oracle. Now he paid the stationmaster to stop the Zephyr and get him onboard. Thompson Springs had no Fred Harvey restaurant or luxury hotel. It had one diner, one motel and one eternal wellspring of water, which accounts for half its name. Few passengers ever boarded a Union Pacific passenger train at Thompson Springs. The small stop was used mostly to ship cattle or sheep to market. 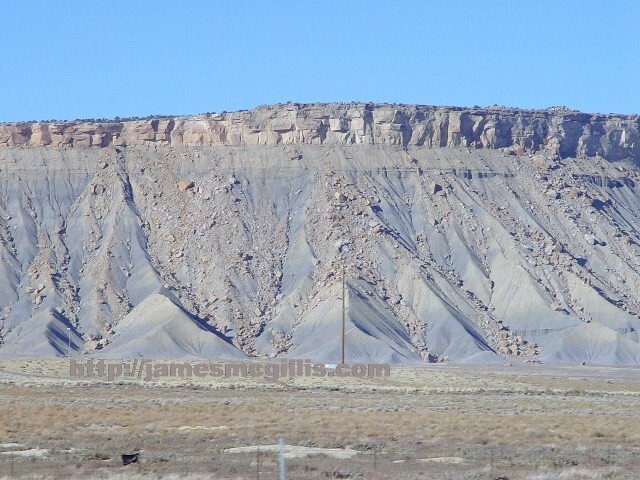 Situated half way between Green River, Utah and Grand Junction, Colorado, Thompson Springs could just as well have been half way to nowhere. While the bearded man pressed fifty dollars into the stationmaster’s hand, the eastbound California Zephyr had already passed both sets of green lights. At that moment, no one on the train expected to stop at Thompson Springs. With throttles wide open, the eastbound Zephyr pulled the grade on approach to the old station. The thrum of the engines and the glare of the headlight shot through the night sky. With a touch of W.C. Fields ringing in his voice, the stationmaster declared, “Sir, there is no time to waste. You are leaving here on that train”. As a powerful wavering light filled the depot, the stationmaster realized that the train was about to pass them by. With one hand he shoved the fifty dollars deep into his pocket, and with the other he threw a switch, activating the red lights on the station platform. Seeing red, the engineer of the Zephyr had no choice but to shut down the throttles and actuate the air-brakes. As brake shoes applied friction to each wheel, the engine of the aluminum-clad streamliner shot past the passenger platform. Grinding, creaking, and then shuddering, the engine came to a halt in a cottonwood grove beyond the station. “Peace at last, peace at last”, was all that the U.P. engineer managed to say. Luckily, the train was comprised of ten cars, so Abbey could board the last car, which stood quietly at the far end of the platform. As a town, Thompson Springs survives to this day for only one reason, which is water. As strange as it may seem, at Thompson Springs there is free flowing water in the desert. Even now, residents can pull up to the town's water dispensing station and fill truck-mounted water tanks as needed. "Be sure to shut off the valve when you are done", reads a nearby sign. First used to support cattle and sheep ranching, the springs later made a reliable water-stop for steam locomotives. As Abbey so eloquently decried in Desert Solitaire, the West was changing. When his train departed Thompson Springs that rainy, autumn night, its gleaming silver locomotive no longer required water-stops. The diesel-electric motors powering its drive-wheels made Thompson Springs obsolete. In Edward Abbey’s early writings, a prescient reader may spot evidence of both his inconsistencies and his growing discontent. A serial monogamist, Abbey married often and spent money freely on such icons of consumption as a red 1975 Eldorado Cadillac convertible. Like the pamphleteers of our early union, Abbey used his wit and his pen to wage metaphorical war against despoilers of the desert he loved. 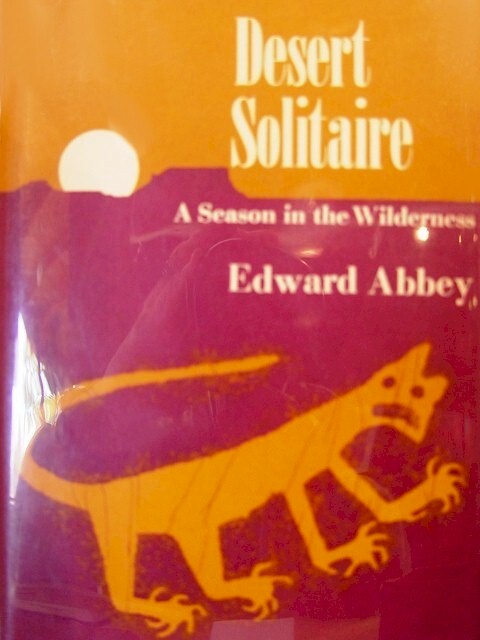 First published in 1968, Desert Solitaire elevated Edward Abbey to celebrity status, especially in the Spanish Valley. In 1974, drawing on his proceeds, Abbey bought a home at 2260 Spanish Valley Drive. There, he reputedly wrote his breakthrough novel, The Monkey Wrench Gang. I use the word “reputedly”, but not to impugn or malign the memories of Abbey’s family, friends and neighbors. 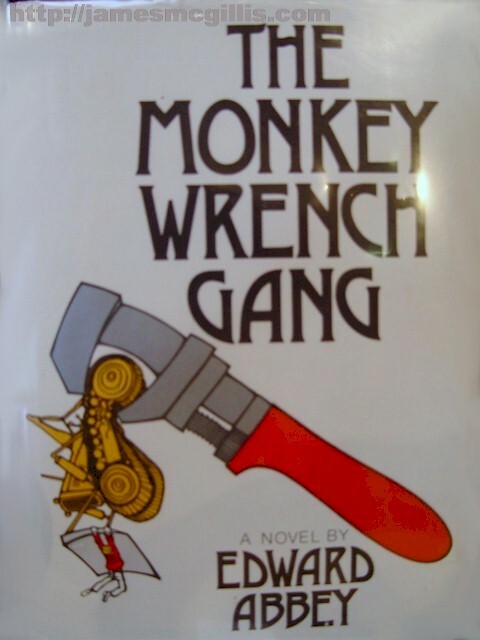 Publication of The Monkey Wrench Gang occurred in 1975. Is it reasonable to assume that Edward Abbey could write, then have edited and published his opus in one year’s time? Thirty years after his death, if we were to poll current Moab residents regarding Edward Abbey’s legacy, half would love him and half would revile him. If Abbey were to return today, his spirit might align more closely with those who hate him than with those who love him. Abbey was never one to take himself too seriously. His style of self-deprecative humor compares well to Will Rogers or Mark Twain. The Abbey House, as locals call it, is currently on the market for under $300,000. Although the house and grounds need some repair, the current owner has done what she can to maintain a mid-century home with style and grace. The day I visited Abbey's Shrine, there were candles lit upon the mantle. The grounds and outbuildings may look like a Tennessee Williams stage set transported to the desert, but then again, one person’s junk is another person’s treasure. Whether new owners repair the house or tear it down, we hope that all future custodians of the property will conserve and retain its large stone fireplace. Local stone, chosen for its pattern, texture and color dominates the outdoor wall of the front entry. 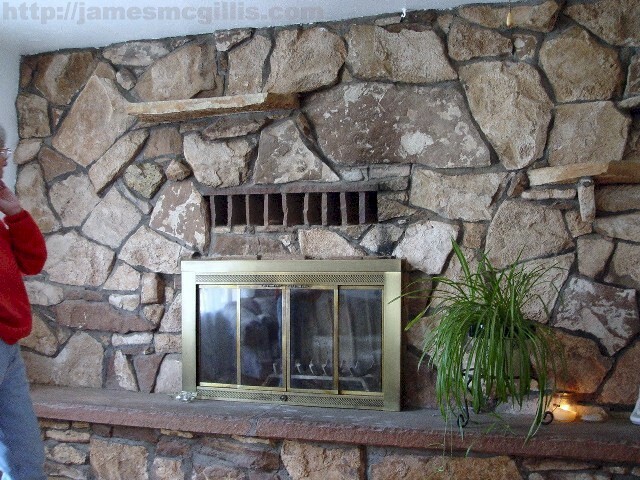 Inside, the opposite face of the same structure makes up the fireplace and living room wall. Harkening back to a time when firewood heated most local homes, stone vents above the hearth circulate warm air into the room. That hearth, as heart, architecturally defines the Abbey House. If tomorrow, a tornado carried away every stick of the Abbey House, that stone fireplace would stand. 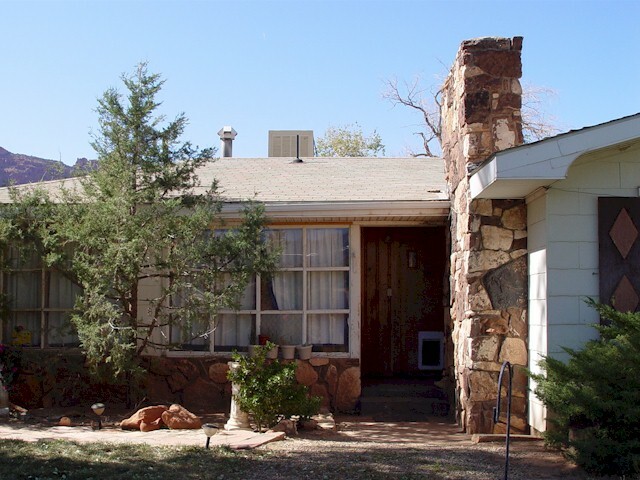 Saving the heart of his former home would be monument enough to Edward Abbey, the iconoclastic author and onetime Bard of Moab.